All sorts of centralized organizations that appear rock-solid may well melt into air as the disintegrative dynamics gather momentum. Rising political and social discord that is generally being attributed to "populism" may actually be the re-emergence of ancient geographic and cultural fault lines. An often-overlooked manifestation of this might be the nation-state of Germany, a possibility fleshed out by longtime correspondent Mark G.
It's both convenient and expedient for politicos to blame "populism" for the fracturing of the status quo. Given the unsavory undertones of ethnic/religious bias of "populism," this allows the media-savvy politico (and aren't they all media-savvy?) to paint his/her opponents as racist via the code-word "populist." Labeling dissenters "populists" doesn't explain or predict anything. In terms of economic classes, it's more insightful to distinguish between the Protected Class (insiders and favored elites) who benefits enormously from the status quo and the Unprotected Class (outsiders, marginalized workers, those without privilege or access to cheap capital). But this doesn't exhaust the sources of profound social discord. As historian Peter Turchin explained in his recent book Ages of Discord, historical eras are either integrative periods in which people find reasons to cooperate and join forces, or disintegrative periods in which reasons to split apart become dominant. The breakdown of the Bavarian CSU and German CDU center-right coalition (refounded post WWII by Konrad Adenauer) is historic. And it has definite regional implications. I think we could be watching the beginning moves not in a "German Brexit" but in the political collapse of the modern German state into multiple components. As I mentioned last year, I personally expect this because modern Germany is a rump survival of Bismarck's Wihelmine German Empire. It has lost all strategic rationale for its existence. And under Frau Merkel it has almost no military forces and no control of its own borders. Such a 'state' cannot long endure. "Mr Seehofer – who is also the chairman of coalition partner the Christian Social Union (CSU) – has agreed to give Mrs Merkel two weeks to try and thrash out a Europe-wide migration policy with other leaders at the European Council meeting at the end of the month." Merkel has zero point zero chance of reaching any Europe-wide agreement on immigration given the present composition of the governments of Austria, Italy, Hungary, Slovakia, Czechia and Poland. Since 2015 all of them have been electorally remodeled into populist based governments with fundamental anti-refugee and anti-migrant views. As an example, when we passed through the Sudetenland last year in Czechia the highway billboards openly proclaimed "No Islam - No Terrorism". Their thinking is vastly closer to Seehofer's than to Merkel's. Merkel can't even control her primary CSU coalition partner any further. What is more likely to occur is the German government, or multiple successor German governments, will move much closer to the eastern European position. And if Merkel attempts to construct a hard left domestic coalition consisting of the CDU, the SDP, the Greens and "The Left" (Die Linke) to continue her present policies, then I expect the CDU itself to experience an internal split and also further hemorrhaging to Alternativ fur Deustschland. Its difficult to see her retaining her position in the CDU after presiding over the collapse of the historic CDU/CSU coalition. New elections are highly likely in these circumstances. And in the last elections the main Center parties - CDU/CSU and also SDP - all lost significant numbers of supporters to the AfD and Die Linke. Another round at this point will probably produce a much larger AfD, plus political gridlock as the Establishment attempts to ignore the democratic result. On an anecdotal basis, last year I again met individuals in Rheinland-Pfalz who in 2015 had been members of The Greens. Come 2017 they all had left the Greens and were wavering between the CDU & AfD. On a related issue: it seems to me the present migration induced political crisis in German politics will cause the PIGS to attempt to rebid and renegotiate the terms of their ECB/IMF bailouts. Thank you, Mark. I think it is fair to say that Marx's famous summary of the disintegrative forces inherent in capitalism--"Everything solid melts into air"-- aptly describes the core dynamics of disintegrative phases. It's instructive to study a map of proto-Germany circa 1866 and ask if the geographic, political and cultural lines visible on this map still pertain beneath the surface of a monolithic modern state. All sorts of centralized organizations that appear rock-solid may well melt into air as the disintegrative dynamics gather momentum. 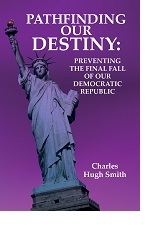 Kindle edition now $6.95, print edition now $15. Thank you, Suzanne S. ($50), for your magnificently generous contribution to this site -- I am greatly honored by your support and readership. Thank you, Dan A. ($50), for your marvelously generous contribution to this site -- I am greatly honored by your steadfast support and readership. Employment expands in the Protected cartel-dominated sectors, and declines in every sector exposed to globalization, domestic competition and cheap capital. If you want to understand why the global economy is failing the many while enriching the few, start with the basics: capital, labor and resources. What happens when central banks drop interest rates to near-zero? Capital becomes dirt-cheap. It becomes ludicrously easy to borrow money to buy whatever cheap capital can buy: stock buybacks, robots, automation tools, interest-sensitive assets such as housing, competitors or potential competitors, high-yield emerging-market bonds, and so on. What happens when cartels take control of core domestic industries such as banking, defense, higher education and healthcare? Costs soar because competition has been throttled via regulatory capture, and these domestic sectors are largely non-tradable, meaning they can't be offshored and have little meaningful exposure to globalization. 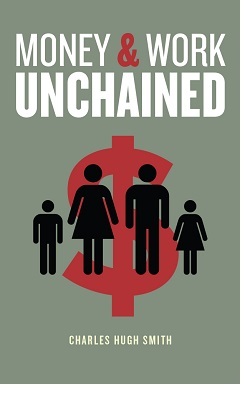 Labor-intensive cartels such as these can pass on their rising costs for labor, resources and profiteering. Do you really think assistant deans could be pulling down $250,000 annual salaries in higher education if there was any global or domestic competition? As for healthcare, I've often noted that healthcare/sickcare will bankrupt the nation all by itself. When a cartel such as healthcare / sickcare can force higher prices on employers and employees, the cost of labor throughout the economy rises. 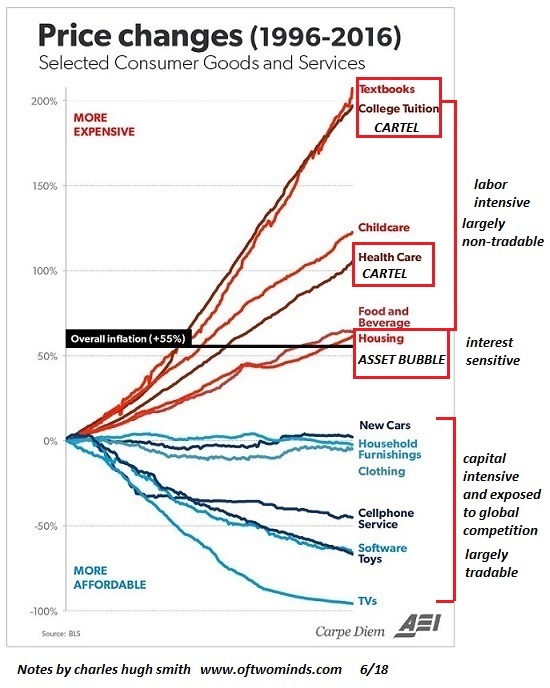 As I've indicated on the chart, labor-intensive cartels in non-tradable sectors--higher education, defense/national security, healthcare and banking-- can pass on their rising labor costs to their captive customers. Central bank policies of super-low interest rates and abundant credit for big players and financiers have made capital cheap. 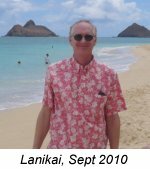 Given a choice between cheap-to-finance robots and software, and ever-more costly labor, what's the rational choice for employers facing unrelenting margin pressure from rising costs for virtually everything--from taxes and junk fees to resources, rent, regulatory compliance and other inputs? It's obvious, isn't it? The rational move is use cheap capital to replace labor as fast as possible. If capital was costly and difficult to borrow, the decision wouldn't be so easy. Cheap capital makes buying political influence easier, too. And with enough political influence, cartels can protect themselves from competition and transparent pricing. 1. Labor-intensive sectors that are largely non-tradable (domestic) and dominated by cartels that can push their higher labor costs onto their customers. 2. Interest-sensitive sectors such as housing that jack up prices as cheap capital pushes valuations into bubble territory. 3. Tradable sectors exposed to global competition and capital-intensive technology such as robotics and automation. What happens when capital is cheap, labor is costly and cartels dominate the labor-intensive non-tradable domestic sectors? Labor costs in the protected sectors soar, pushing prices higher throughout the economy, pushing employers to replace costly labor with cheap capital-intensive technology. Employment expands in the Protected cartel-dominated sectors, and declines in every sector exposed to globalization, domestic competition and cheap capital. So assistant deans, hospital managers, top-tier bankers and under-secretaries of defense are doing just fine while the Unprotected are experiencing rising costs of living and stagnating wages and employment. How's the economy doing? It depends on which class you're in. The Protected Class is doing just fine, the class with access to cheap credit and participation in asset bubbles has never had it so good, while the Unprotected Class faces a bleak future of lower real wages, rising costs of living and a social mobility ladder with few rungs left. Thank you, Guy T. ($50), for your superbly generous contribution to this site -- I am greatly honored by your steadfast support and readership. Thank you, Helen S. ($10/month), for your marvelously generous pledge to this site -- I am greatly honored by your steadfast support and readership. You deserve a realistic account of the economy you're joining. Dear high school graduates: please glance at these charts before buying into the conventional life-course being promoted by the status quo. Here's the summary: the status quo is pressuring you to accept its "solutions": borrow mega-bucks to attend college, then buy a decaying bungalow or hastily constructed stucco box for $800,000 in a "desirable" city, pay sky-high income and property taxes on your earnings, and when the stress of all these crushing financial burdens ruins your health, well, we've got meds to "help" you--lots of meds at insane price points paid for by insurance-- if you have "real" insurance without high deductibles, of course. Here's the truth the status quo marketers don't dare acknowledge: every one of these conventional "solutions" only makes the problem worse. 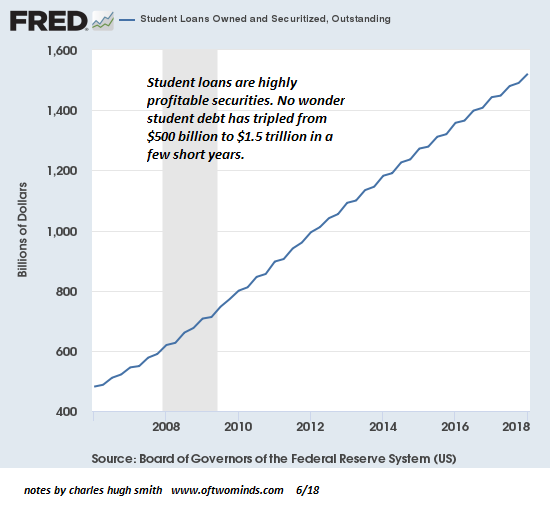 Student loan debt only makes your life harder, not easier, as the claimed "value" of a college degree is based on the distant past, not the present. The economy is changing fast and the conventional "solutions" no longer match the new realities. But don't expect anyone profiting from the predatory profiteering higher-education cartel to admit this. The high cost of housing isn't "solved" by buying in at the top of an unprecedented bubble. Buying into bubbles only makes the problem worse, for all bubbles eventually pop. The "solution" to crushing levels of debt is not to borrow more just to prop up a rotten, corrupt, dysfunctional and self-serving status quo. In effect, the young generations are being groomed to be the hosts for the parasitic classes that feed on young taxpayers, student loan debt-serfs, young buyers of bubble-priced housing, unaffordable sickcare "insurance" and all the rest of the status quo "solutions." As writer Peter Turchin has explained, societies in decline overproduce elites.Those promised an elite slot who are left out become the engine of social unrest. The status quo claims that getting a college diploma more or less guarantees you a slot in the elite class of folks with secure incomes and opportunities to get ahead and build real wealth. The reality is only the top 5% of the work force are doing well. So of the 33% of the work force with university diplomas, the system only creates slots for the top 15% of that educational elite. The next 15% (the rest of the top 10% of the entire work force) can pick up the 2nd tier technocrat positions and everyone else gets the scraps: insecure jobs, mediocre pay, limited opportunities. This parasitic predation is guaranteed by your federal government: you know, the institution everyone looks to for "solutions." How did millions of students earn college diplomas before the hyper-financialization of the economy and before assistant deans made $350,000 a year in "competitive" salaries? It's a mystery lacking any mainstream explanation. Don't worry about soul-crushing commutes, homeless encampments or rapidly rising taxes: asset bubbles make everything bearable, until they pop. You deserve a realistic account of the economy you're joining. 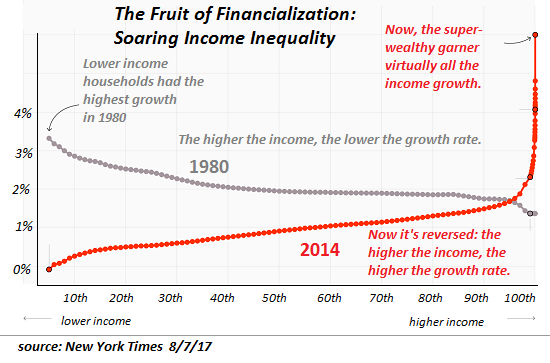 Here's reality: the vast majority of the gains reaped since your birth have flowed to the very top of the hyper-financialized wealth-power pyramid. As Bucky Fuller noted in his famous dictum, “You never change things by fighting the existing reality. 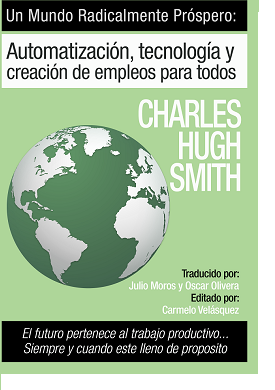 To change something, build a new model that makes the existing model obsolete." Rather than fight a system designed to stripmine you for life, seek a model for your life that obsoletes all the perverse conventional "solutions." 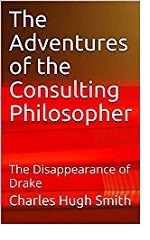 I'm putting four books on sale which may help provide an alternative context for your life-decisions. Thank you, Laura D. ($50), for your superbly generous contribution to this site -- I am greatly honored by your steadfast support and readership. 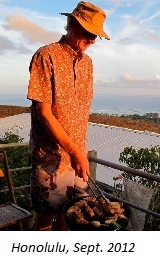 Thank you, Norman A. ($10), for your marvelously generous contribution to this site -- I am greatly honored by your support and readership. 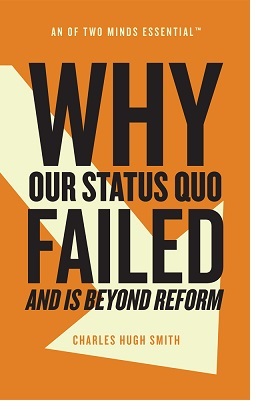 Market "fixes" fuel wealth/income inequality which feeds political and social instability. There are two Grand Narratives about the U.S. economy and asset markets: the mainstream narrative is that nothing is fundamentally wrong with the economy, and so no structural changes (and the sacrifices such changes entail) are needed. In this narrative, the only problem that needs solving is markets stop bubbling higher. 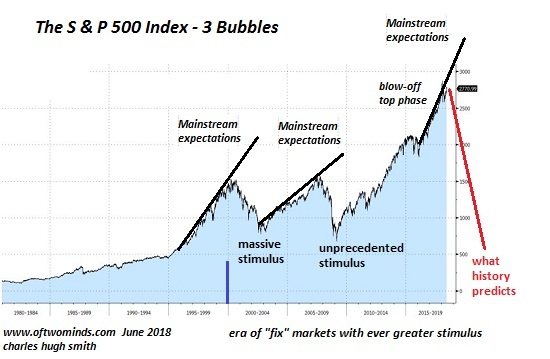 The mainstream always expects markets to keep bubbling higher essentially forever, but reality intrudes and the asset bubbles pop. The solution in this narrative is to "fix" markets with massive stimulus: fiscal stimulus from the Savior State and monetary stimulus from the central bank -- Federal Reserve (reinflating bubbles that enrich the already-wealthy is our primary job). Note that the mainstream never expects bubbles to deflate. The economy is always doing great at the bubble top, and expectations are always that assets will consequently continue bubbling higher. Then there's a horrendously unexpected crash. 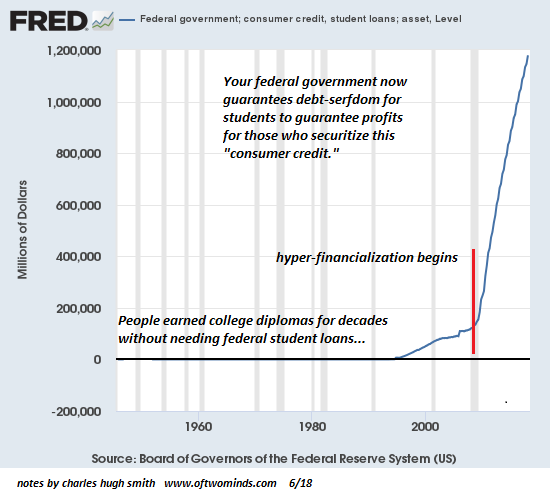 The status quo panics, and the Federal Reserve and the Savior State rush to provide massive stimulus--tax cuts, tax rebates, more federal spending, lower interest rates, bond buying, easier lending standards, increased liquidity, and so on. Asset prices respond to these constant injections of uppers very predictably:they leap higher as participants realize the "Fed put" is in place: the central bank will not let markets decline, so the profitable strategy is "buy the dip." 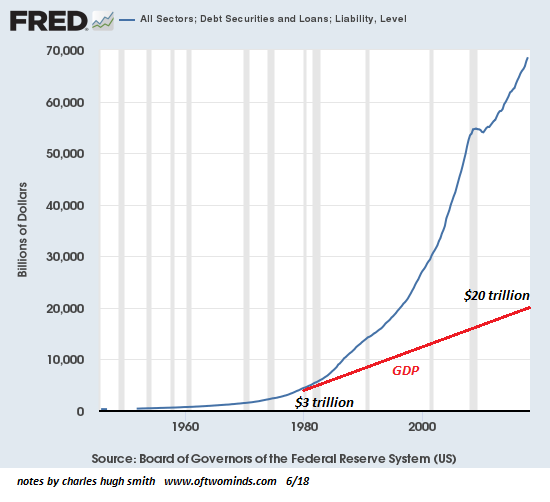 Note that the quantity of stimulus required to "fix" the markets increases exponentially every bubble-pop. Where a sharp decline in interest rates and conventional monetary stimulus stopped the 2002 crash in its tracks and reinflated asset bubbles, the next bubble-pop crash in 2008-09 required an unprecedented range of unconventional stimulus to stop the crash and reinflate the era's third asset bubble: zero interest rates (never done before), $4 trillion in bond and mortgage purchases (never done before), ending mark-to-market pricing of financial instruments (never done before) and unlimited liquidity to the banking sector and financial markets (never done before). And so here we are again, at the top of a monumental parabolic blow-off top in stock markets and bubbles in other asset classes such as bonds and real estate. And once again, the mainstream expects the bubble to keep rising. Doesn't it strike you as a bit insane to keep inflating unprecedented bubbles after the previous bubbles popped, and expect this new bubble to never pop? The alternative Grand Narrative is the economy has changed and the problems are systemic: "fixing" the markets (i.e. using markets as signaling devices) doesn't address what's structurally broken; it simply increases the eventual pain when "fixes" fail the next time. 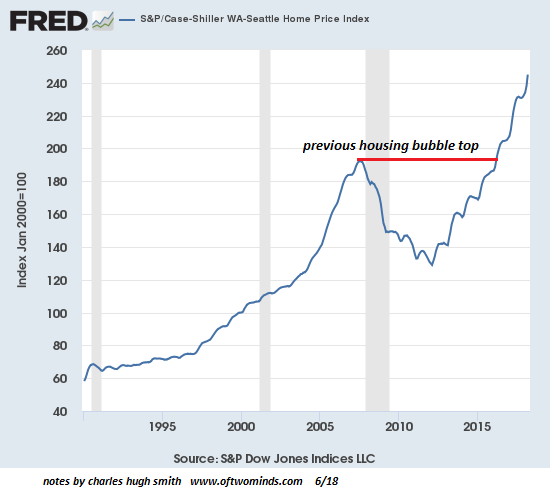 I hate to break this to you, but parabolic blow-off top bubbles burst, with catastrophic consequences for everyone who believed bubbles never pop and everyone who placed their capital in the hands of Wall Street and the conventional financial sector. We are entering troubled times. 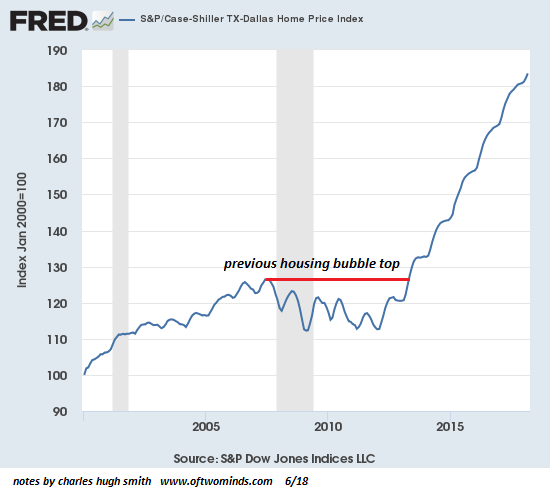 The opportunity to address what was broken 10 years ago has been squandered by the status quo's reinflation of an even larger bubble as the "fix" to the bursting of the last bubble. The question for individual investors is: are you prepared to invest in troubled times? Put another way: are you ready to entrust your wealth to Wall Street via passive investments in stock indices and funds that are betting that Netflix, which just doubled in a few months, will double again from $400 to $800 and then double again from $800 to $1,600 because the global demand for lousy movies is limitless and there's no real competition for streaming lousy movies? Investing in troubled times boils down to one thing: control of your capital.Give the control of your capital to others, and you'll get what deflating bubbles deliver. Take control of your capital, and other possibilities emerge. 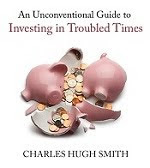 I wrote a book about taking control of one's capital, An Unconventional Guide to Investing in Troubled Times, and since we're entering troubled times, I've put the book on sale this month: $2.99 for the Kindle (digital) edition, and $9.95 for the print edition (a 50% discount). Read the intro and chapter One for free here. And let's not forget the consequence of "fixing" markets rather than addressing fundamental imbalances: Market "fixes" fuel wealth/income inequality which feeds political and social instability. Thank you, Jason K. ($10/month), for your outrageously generous pledge to this site -- I am greatly honored by your steadfast support and readership. Thank you, Daniel E. ($6), for your marvelously generous contribution to this site -- I am greatly honored by your steadfast support and readership.